Participants from eight countries, which included, Saudi Arabia, UAE, Oman, Qatar, Kuwait, Jordan, Lebanon and Bahrain, competed in this tough event and took part in 3 categories, namely: Service Advisor Skills, Parts Counterperson Skills and Technician Skills. Almoayyed Motors performed skillfully and were highly recognised at the competition and with excellent performance, helped put Bahrain on a global platform. At the event, Bahrain won a few awards and this achievement has even impressed the regional management of Ford, who were taken in with the dedication, commitment and professionalism shown by team Bahrain’s participants. 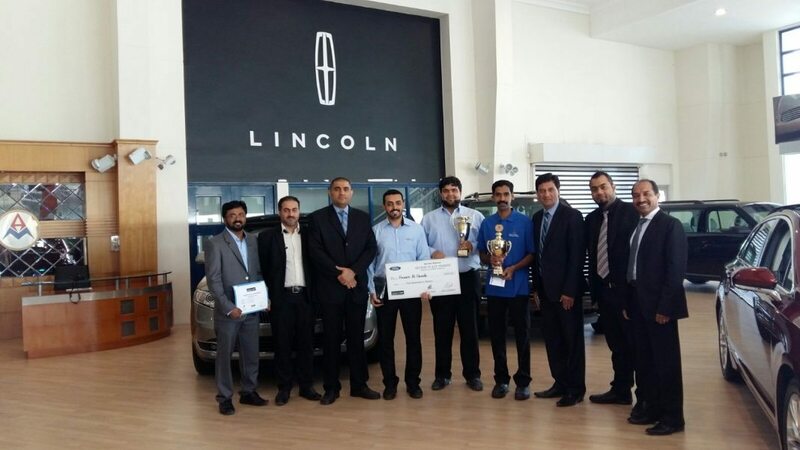 The following three participants were recognised at the event – Service Advisor Skills Competition – 2nd Place Winner, Hussain Ali Al Qassab; Technician Skills Competition – 3rd Place Winner, Tony Thalakkottur; and Parts Advisor Skills Competition – 4th Place, Qusay Shaban Hassan. Seen here at the presentation of the cash prizes are, Manoj Unni, Hussain, Yasser Maraj, Hussain Al Qassab, Qussay Shaban Hassan, Tony Thalakottur, Sandeep Mathur, Mohamed Ali and Irwin Aaron.